I wanted to share Mommy & Me with the Hubs this week becuase he did so much to make my Mommy & Me picture possible. 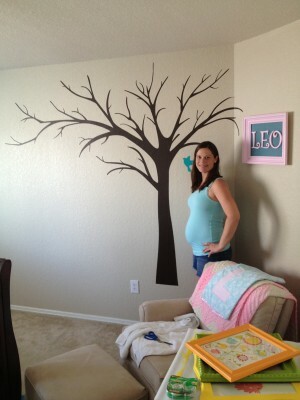 The tree decal is up! We still have to add the leaves, birds and birdhouse but the tricky part is over. 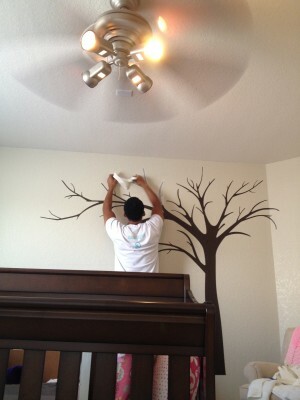 The Hubs did a great job and was way more patient than I ever could have been with all the pieces and branches. He doesn’t really get in to the whole decorating thing, he will give his opinion when asked, but he pretty much is ok with whatever I pick out for our Milkshakes room. 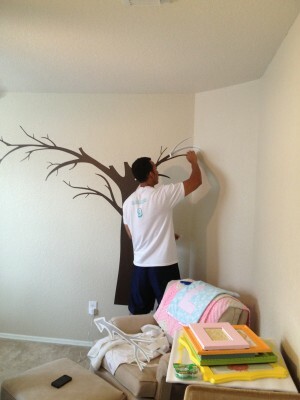 But when it came to the tree he wanted it to be perfect. I think he did a really good job, you can’t even tell where one piece ends and another begins. Peeling off the final piece of paper for the branches. We plan to get the leaves up this week…it’s going to be a challenge. The leaves are small so sticking them to the wall will be easy, but figuring out which branch they go on will be a little tricky. A picture was included with the directions but it’s a small picture and there are about 50 different leaf clusters and another 100 individual leaves. I know we could probably put them where ever we like, but the picture looks so perfect so I think matching it up will be best. The tree looks great. it’s a really nice decoration for her room. Love that tree! Great Belly too!! It looks fabulous!! I love it!! You look great as well!! It looks great..and your belly is so stinking tiny!